“The angel of the Lord called to him from heaven and said, ‘Abraham, Abraham!’ And he said, ‘Here am I.’ He said, ‘Do not lay your hand on the boy or do anything to him, for now I know that you fear God, seeing you have not withheld your son, your only son, from me’” (Gen. 22:11–12). With Isaac lying upon the altar, Abraham takes his knife and moves to sacrifice his son (Gen. 22:10). 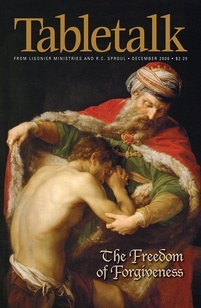 And just as He seemingly gave the promised heir to the patriarch and his wife at the last possible second, the Lord rescues Isaac just in the nick of time. Calling out for Abraham to stop via the angel of the Lord, God says that He now knows that the patriarch fears Him (vv. 11–12). Does verse 12 suggest the Lord was not certain the patriarch would pass this test? As John Calvin tells us in his commentary, we must not answer this question affirmatively. God, he says, is speaking on our level so that we may understand Abraham has passed the test. Yet to stop with this explanation would be to miss the significance of this passage. There is more than meets the eye here when we look at what it means to fear God and to be known by Him. Fearing the Lord is the natural and inevitable result of our justification. James 2:14–26 notably deals with the Aqedah (the binding of Isaac) of Genesis 22 and belabors the point that faith is not merely verbal profession or intellectual assent. Rather, trust in the Almighty always moves us to do good works in service to Him. James’ use of Genesis 22 to define justifying faith coupled with the Lord’s approval of Abraham’s fear in the same chapter reveals that to fear God is to obey Him. Those who fear the Lord want to honor Him in worship, which includes living an upright life (Job 1:1). All who fear God will love Him, His people, and His truth (1 John 5:1–4). Genesis 22:12 also teaches us that God knows those who fear Him. This does not mean the Creator is unaware of some people and not others, for He does comprehend all things. Nevertheless, in a special way the Lord knows His people. To be known by God in this manner is to be approved by Him as those whom He has declared righteous. If we are known by God we need not fear that Jesus will say to us “depart” (Matt. 7:21–23), and we are known by Him only if we love Him and do His will (1 John 5:3). As the early church father Jerome exhorts us, “Let us walk therefore in Christ, and then God the Father will know our way” (Homilies on the Psalms, I). Matthew Henry writes, “The best evidence of our fearing God is our being willing to serve and honor him with that which is dearest to us.” There are many ways in which we can do this. It may mean using your talents at a job with a lower comparative wage in order to do ministry more effectively. Or, perhaps you need to give up some time to serve the church? Do not hesitate to offer the sacrifice God is asking of you, and you will be assured that He knows you.